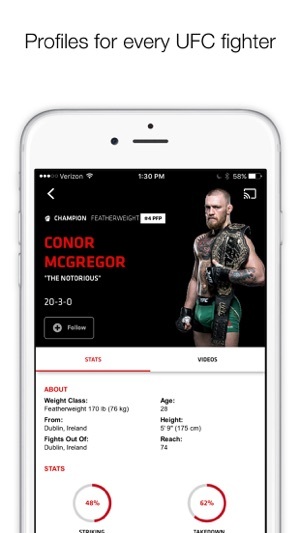 The UFC app is the ultimate tool for the dedicated fight fan! Get breaking news, exclusive video, and live streams, and watch Pay-Per-View events directly on your Apple device. Sign up for UFC FIGHT PASS to watch exclusive UFC FIGHT PASS events live. Plus, get access to the world's biggest fight library, featuring UFC events plus PRIDE FC, STRIKEFORCE, the WEC, and more. UFC FIGHT PASS is available in a monthly ($9.99/month), 6 month ($53.94), and 12 month ($95.88) subscription. Payment will be charged to your iTunes Account at the confirmation of purchase. All subscriptions are set to auto-renew on the expiration date. Subscriptions will auto-renew at the prices above unless turned off at least 24-hours before the end of their respective periods. Subscriptions can be manage by the user including turning off auto-renewal in the Account Settings. 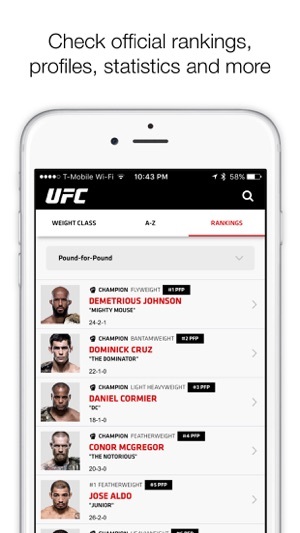 You can also use the UFC app to browse fight cards, check broadcast times, and look up fighter profiles, while the 'Alerts' feature allows you to set up alerts on your Apple device for breaking news, fight results, and ticket sales. Schedule – browse cards for upcoming events, check broadcast times, buy Pay-Per-View, watch interviews, press conferences and fight videos, set broadcast reminders, buy tickets, and see results for past events. 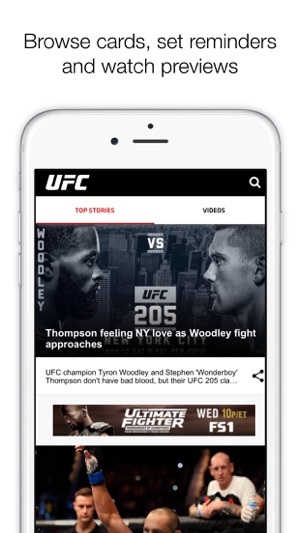 News – the latest breaking news on UFC fights, fighters and operations, direct to your Apple device, as it happens. 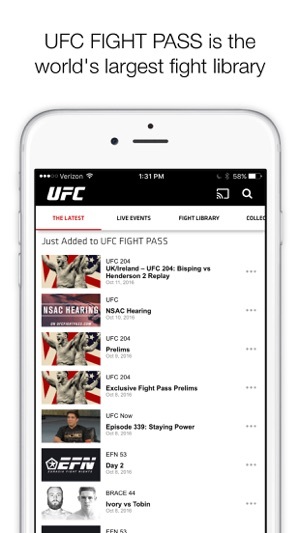 UFC FIGHT PASS – the UFC's digital streaming service is home to the world's largest library of fight video and also hosts live streams of UFC Fight Nights and other top fighting promotions from around the world, including GLORY Kickboxing and the Eddie Bravo Invitational submission grappling series. Each UFC event also features Early Prelim bouts which air live and exclusively on FIGHT PASS. Alerts – set up alerts to your Apple device for tune-in, breaking news, results and ticket sales. 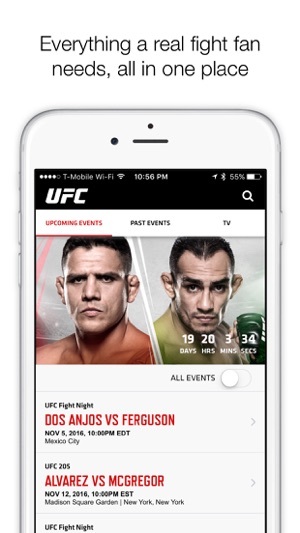 Tickets – buy tickets for UFC events direct from your device. Photos – access full photo galleries from UFC events around the globe.